We kept the general feel of the old site, but freshened it up here and there. 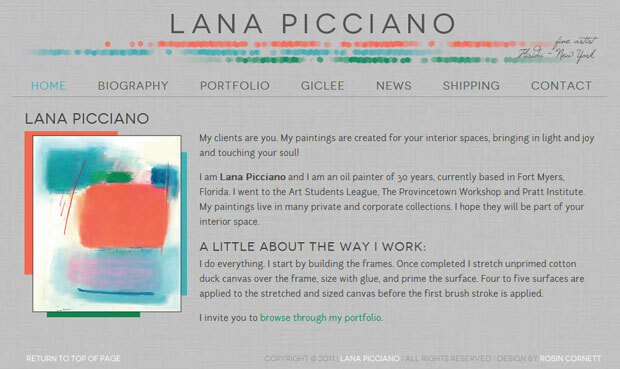 We incorporated custom fonts and added some pizzazz to her portfolio page with lightbox (overlay) functionality–understandably, Lana’s portfolio was the most important element of the site to her. Also, at the time, Lana wasn’t sure she wanted to have a blog, but recently decided that she would actually like to try it. With WordPress, all it took was adding the new news page to her menu and she was up and running–just one more thing to love about WordPress! The term “giclée print” connotes an elevation in printmaking technology. Images are generated from high resolution digital scans and printed with archival quality inks onto various substrates including canvas, fine art, and photo-base paper. The giclée printing process provides better color accuracy than other means of reproduction. You can find out more about purchasing a giclee of Lana’s painting A Sunny Day on her site, but you’ll be in line behind me.